I can remember a few years ago when my nephew and niece begged my sister to buy them Heely’s for Christmas. Much to their excitement on Christmas morning, there were two brand new pairs of Heelys waiting for them under the tree. Since my kids were still pretty small at that time I hadn’t really heard of Heelys. That all changed a few months ago when Jeremy started asking me if he could have a pair for him self. Heelys are the two-in-one shoe that lets you take life at your own pace. When the wheels are out, the stylish designs preform and look like any other shoe. With the wheels easily put back in, you can roll at a different speed. Heelys are about exploring your freedom, unleashing the fun and empowering you to be fearless. I was very excited when I was asked to review the new Heelys HX2. These four new styles were just released in the Heelys shop and in stores last month. When I found out that they were not only going to be sending Jeremy a pair of the Stingray HX2 (pictured above) but there were also going to be sending me a pair of the Adult Heelys, the Jazzy HX2, I honestly kind of chuckled picturing myself skating through the house and grocery store in my new shoes. 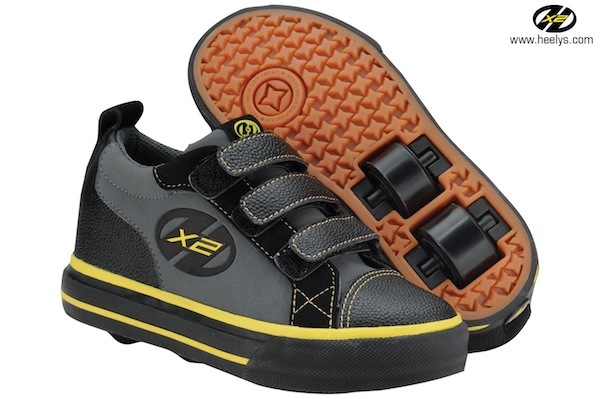 The Regular Heelys come with one large removable wheel on the bottom and the new HX2 Heelys have 2 small removable wheels. I have seen lot’s of kids wear their Heelys but I had never actually seen them up close, so I wasn’t sure how easy the wheels would go in and come out. When the shoes arrived they had the wheel coverings on the bottom and the wheels were in a plastic package. The shoes also came with a tool to remove the wheels cover very easily. Everything came off super easy and the wheels went right in the slots. The Jazzy HX2 were really pretty cute. They weren’t a style that I would normally go out and buy but now that I have had a chance to wear them I really like the look and feel of these shoes. They are available up to an adult size 9 and come in both a light blue and black with pink stitching. I really like the bold look of the pink and black. Jeremy received the Stingray HX2 that comes in a cool black and yellow color. I love the fact that these shoes have 3 pretty large velcro straps making these shoes easy to get on and off. The smaller wheels make these ideal for people who have never worn Heelys before and need a little practice getting the hang of things. Once you have mastered the shoes with both wheels you can convert these into normal one-wheel Heelys. So when I first put the Heelys on, I have to admit I was a little nervous that I would fall but after going across the living room a few times, I had it down in no time. Its really a lot of fun to be able to skate across the living room and feel like a kid again. So far I have only worn the Heelys around the house but I think it would make grocery shopping a much more interesting chore in the near future! Now that I have gotten the chance to try the new Heelys HX2 shoes, I am a big fan. They are fun and something that Jeremy and I will be able to do together and have that bonding time doing something that we both can enjoy. Since it’s still pretty cold outside Jeremy will have to stick with skating around the house but as soon as the weather warms up I can’t wait to take him to the park in our new shoes. I also like him being able to take the wheels out so that he can wear his new shoes to school. For more amazing Heelys shoes and other products including the other HX2 styles for girls be sure to check out the Heelys Shop! Also connect with Heelys on Facebook and Twitter for great deals from Heelys! Disclosure: This is a non-paid post and honest opinions were used. Thanks to the company and/or pr agency who provided me with complimentary Heely’s for my family to test out. All opinions are based on my own experience and may differ from others.